Not every online slot has to include several bonus games and a compelling narrative; sometimes it’s fun to play a game in which you spin the reels and win money depending on how the symbols land. That’s not to say that Super Diamond Deluxe doesn’t offer some added extras because it certainly does – a progressive jackpot for example – so read on to find out more about this Blueprint Gaming machine. 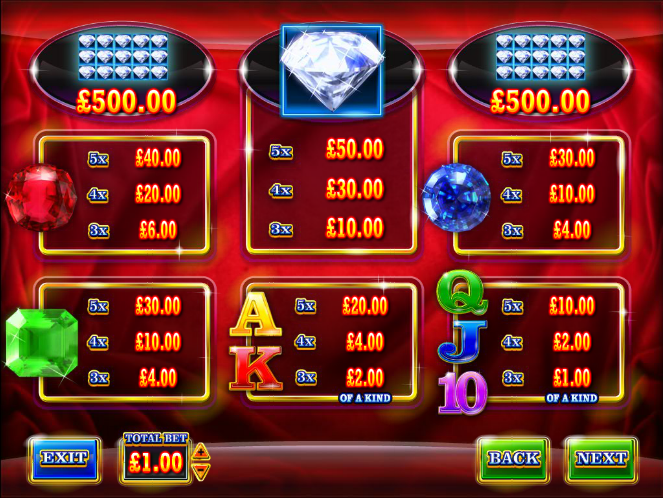 Super Diamond Deluxe is a five reel slot with ten fixed paylines. Those big reels occupy almost all of the screen space and are placed on a lush red backdrop – everything here gives an impression of luxury. There are four main symbols and these are all expensive-looking gems – green, blue, red and a sparkling clear diamond. Minor symbols are the standard 10, J, Q, K and A. There are no special symbols here such as wilds or scatters but there are some extra features explained below. Symbols are also stacked on the reels which means it’s possible to earn blocks of wins rather than just one at a time. The most noticeable extra here is the ability to create winning combinations which do not begin on reel one. Normally any combos would need to begin on that first reel but here they do not; you can win with combos beginning on the first, second of third reels. You will still need to land those icons on the paylines and you can check these by clicking on the ‘Paytable’ button in the bottom left hand corner. 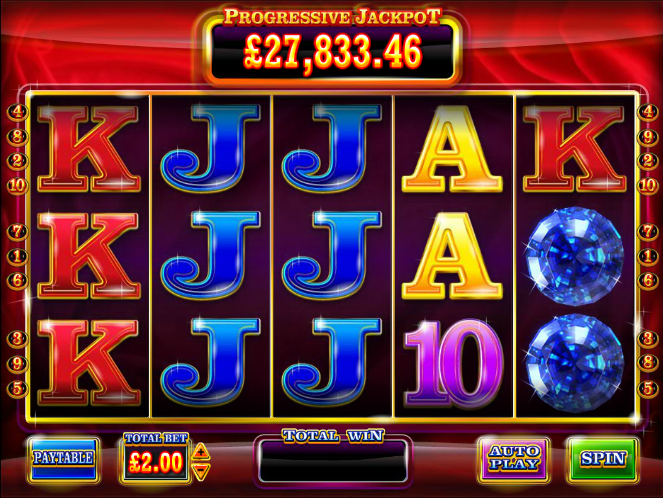 You can see the running jackpot total above the reels and to win it you will just need to be lucky. No winning combinations are needed and all you need to do is turn all the reels gold. This is a random occurrence and managing it will win you that hefty sum above the reels. We like this game, there’s no need to worry about wilds or scatter symbols and you can just set the Autoplay, sit back and watch the well-designed reels. The possibility of a progressive jackpot win is an extra incentive.